Fireflies are well known for their bioluminescence - glow-in-the-dark - properties. Although all fireflies use luciferin as the sole reagent for this to take place, the emitted color can vary from green to red among the different species, yellow-green for fireflies, green to orange for click beetles and green to red for railroad worms. This unsolved problem in chemistry however is about to be cracked as researchers from Osaka University have re-analysed the actual molecule responsible for the luminescence called oxyluciferin (DOI). Here is what sets the luminescence in motion: with ATP and luciferase, luciferin is converted to luciferin-AMP which reacts with oxygen and then loses AMP and then carbon dioxide to form the excited oxyluciferin which then decays to the ground state with emission of a photon. The researchers synthesised oxyluciferin in the laboratory using a new work-up procedure (growing crystals by evaporating from isopropanol) that enabled them to side-track decomposition and enabled them to determine accurate crystal structures. First surprise: the compound is an enol and not a ketone. In (physiologically more relevant) solution, enolic oxyluciferin is found to equilibrate quickly with the mono- and diphenolate and second surprise: within a narrow pH range these species can account for the entire emission spectrum. 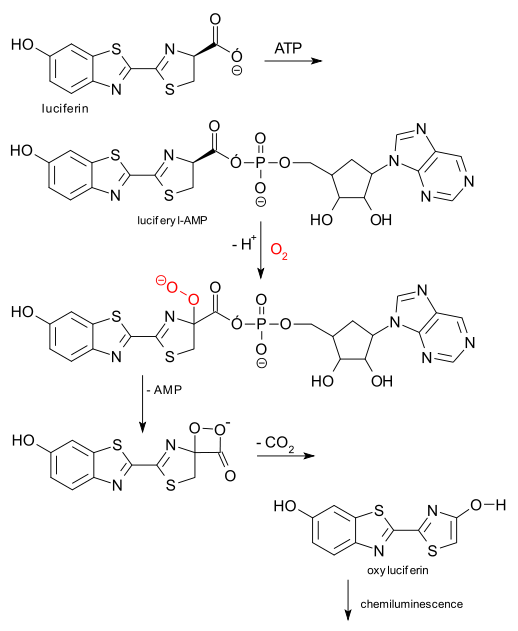 So no longer need then to invoke any of the other theories that have been circulating: keto-enol mechanism (color variation due to keto-enol isomerism) , twisted intramolecular charge-transfer (TICT) mechanism (differences in rotational freedom excited state), or a microenvironment mechanism (color variation due to specific luciferin - luciferase interactions).